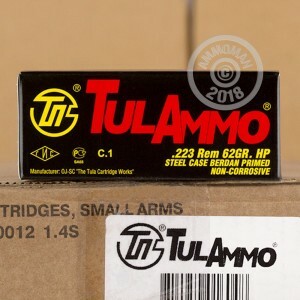 Take advantage of getting an all-around great ammunition for anything from varmint hunting to self defense to range training with this product offered by Tula! These 223 Rem rounds have a 62 grain hollow point bullet, sure to deliver a lethal blow to your target. They contain Berdan primers and have steel casings, traditionally thought to be an inferior choice compared with a more common Boxer primed brass cased cartridge. Tula has done a great job figuring out how to produce a Berdan primed steel round that will function just as well, and that is also non-corrosive, giving you the benefit of a great product for a much more economical price. Not only will you save money by purchasing Berdan primed steel, this bulk quantity of 1000 will save you money by the round, plus you qualify for free shipping! Plenty to shoot, plus plenty to store. What a great concept! Tula Cartridge Works was founded in Tula, Russia in 1880 and is one of the most significant producers of small arms ammunition in the world. Their products are marketed and distributed in the USA under the name TulAmmo. 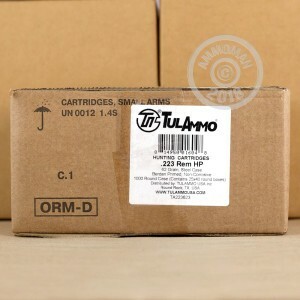 They are known for producing ammo that can withstand extreme weather conditions, hot or cold. Purchase your 1000 rounds today and see for yourself how Berdan primed steel cased ammo can be beneficial for the budget conscious shooter. 62gr accurate and reliable out of PSA 1-7 twist barrel. Burned through 1/2 the case so far and zero issues. Our range is only 100yds. Ringing the 6” gong nearly every shot with iron sights. My misses are on me. No problems or surprises with this ammo fired a couple hundred rounds with no issues. Shoots great with no issues. Gun gotta a little dirty but I don't mind because I clean it after every outing. Love these. Never fail, the zinc coated seems more accurate and the barrel stays clean. I buy Tula for all my weapons. I don't know if i got a bad batch or what. But twice I went to the range with a previously cleaned Ruger SR556 and these would jam about 1/2 way through my 30 round pmags. Jammed due to the steel casings would split in the chamber and I could not get it out for the life of me. I had to have the local gun smith remove it. He said it was due to the casing getting too hot, even though it was the first round. He said this was common with this ammo. I sold the rest of my 900 rounds and will never buy this again. Maybe its just my ruger, maybe its the ammo, but I have never had any jams of this kind with other brass casings. Outstanding quality! Super fast shipping.